The demigods reace to the rescue to find that Grover has made an important discovery: two new powerful half-bloods, whose parentage is unknown. But that’s not all that awaits them. The Titan lord, Kronos, has set up a devious trap, and the young heroes have just fallen prey. 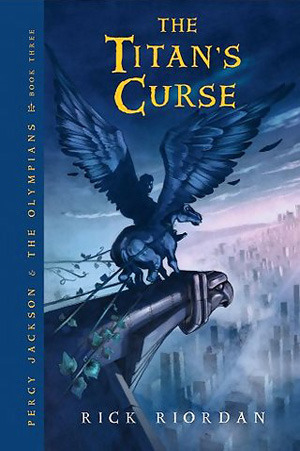 The third book of the Percy Jackson series and in my opinion the best so far! The beginning of the book was a bit abrupt. Even though I read the second book a few weeks ago, I felt like I was lost. Thalia is suddenly a part of the group without any explanations about what happened after she became a person again. I found myself wondering if this was the third book, or if by mistake I picked up the fourth and that was why I couldn’t understand the beginning. But no, this is definitely the third book. There’s just a huge gap between this and the second one. Even though Annabeth doesn’t play such a big role in this book as in the previous ones, I just realised how much I like her. I guess you have to lose something to understand it’s value. She reminds me a lot of Hermione from the Harry Potter series. The smart one who always has a witty comment to make. Thalia, on the other hand is not a character I enjoy. She acts like she knows better than everyone and always wants to be in charge. Everyone seems to like her, respect her opinion and treat her like she, as the daughter of Zeus, is the strongest one of the Demigods. For some reason, though I disliked her for the most part of the book. The Friday before winter break, my mon packed me an overnight bag and a few deadly weapons, and took me to a new boarding school.